Yesterday you learned how to tap iTunes' Browser View for easier navigation of your music library. 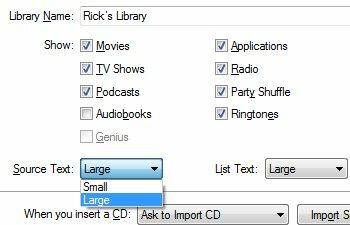 Today, let's look at another way to make iTunes easier: by making text larger. 2. In the General tab, set Source Text to Large. 3. In the same tab, set List Text to Large. 4. Click OK to close the Prefs window and implement your changes. Presto! Now the text in the lefthand menu bar should be easier on the eyes. Same goes for the text displaying your song list. Sometimes the best hacks are the simplest.